PETITE DECEMBER: WHAT'S ON MY SKINCARE SHELF? 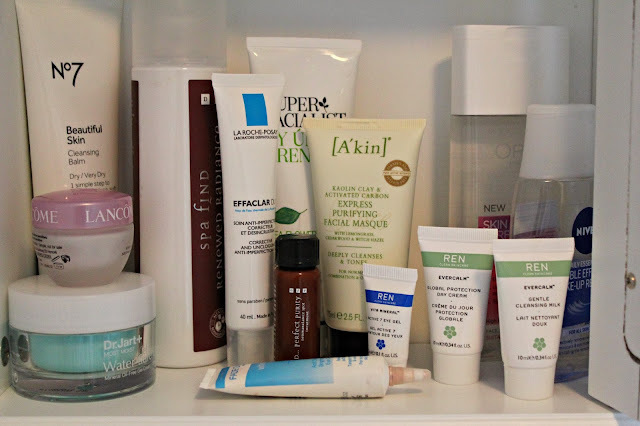 After watching tons of videos, reading blog posts and buying new things, I have finally found a good skincare collection/routine which works for my skin, and it is time to give you a tour of my most-used products, gaining a place on the shelf. Removers: I would never go a day (or night), without removing my makeup. The first of my favourites in the Nivea Daily Essentials Eye Makeup Remover, which I did a full review of here. This is my number one high street eye makeup remover, and you get get waterproof mascara off your lashes in a matter of one sweep. Then, for face makeup, is the L'Oreal Skin Perfection 3 in 1 Purifying Micellar Solution, which is a really nice, high street (apparent Bioderma dupe) makeup remover, without going anywhere near the wipes. Cleansers: After realising foaming cleansers were one of the worst things I could be using (although I have one lingering in the bathroom which I need to finish), I have 3 main creamy cleansers which I use. The first is the No.7 Beautiful Skin Cleansing Balm, which is a cream more than a balm. It claims to be for dry skin, but mine is combination and I haven't had any issues. The other I have is the Spa Find Renewed Radiance Energizing Cleanser* which is a huge bottle, and the cleanser itself is really lovely, and it also removes waterproof mascara, but it stings the eyes so I use this after removing makeup. I also have a Ren Evercalm Gentle Cleansing Milk Mini there, which is nice too. Masks: I love the Una Brennan Tea Flower Pore Purifying Clay Mask, as you already know, and it works wonders for any blemished skin I may have, and instead of rambling, click here to read the full review. Another I have is the A'Kin Express Purifying Facial Masque* which I find also works really well for my blemishes. I use a mask twice a week, so I alternate between the two of these, one on Sunday, the other on Wednesday. I must say, I love the packaging of the A'kin one, and although the bottle is small, you don't need much. Treatments: Almost halfway through the La Roche Posay Effaclar Duo, this is something I probably can't live without anymore. I do notice difference, and I love how it can be used in many different ways; by itself, on problem areas, or all over the face under (or over) moisturiser. You can read my full review here. Then, I have the Spa Find Perfect Purity Dermabalance Spot Treatment*, which is incredible. It is what I describe as liquid clay in a bottle, and you take some on a cotton bud, and put it directly onto the blemish, and feel it tingle for a while, and then, go to bed and in the morning it will have improved the area dramatically, I swear by this nowadays. Moisturiser: So, to start off with, I have the Dr Jart+ Most Moist Water Sure Gel which I use daily underneath my moisturiser, as it is basically Hydraluron in a little tub, designed to lock in the moisture from whatever day cream you put on top. It is incredible, and I may whimper at the price when this runs out (£26.00, but I found it in a clearance at £6.50...). After that, we have the Lancome HydraZen Neurocalm Moisturiser which I love, but when this mini sample runs out, I will not be repurchasing, which is a shame, as it really soothes the skin overnight if you have any blemishes or redness, especially after using a mask. I also have the Ren Evercalm Global Protection Day Cream which apparently protects you from pollution, which is strangely cool? Eye Creams and Gels: For a daytime eye gel, I use the Ren Vita Mineral Active 7 Eye Gel, which is a really cooling eye gel which absorbs quickly to the under eye area, which is why I like using it in the mornings. For night time, I prefer a more creamy, hydrating offering, and in this case it is the Fade Out White Anti-Shadow Brightening Eye Cream* which is also really nice. It offers hydration whilst still fading darkness and puffiness a tiny bit overnight (trust me, my bags are genetic and they ain't going anywhere). Great post! Seems like you've got your skincare routine down to a T! I really enjoy using the REN samples that I have but I really want to try A'Kin and the super facialist products! Can't believe you have a shelf full of skincare! I have pretty much nothing soooo bad! I really need to start looking after my skin.